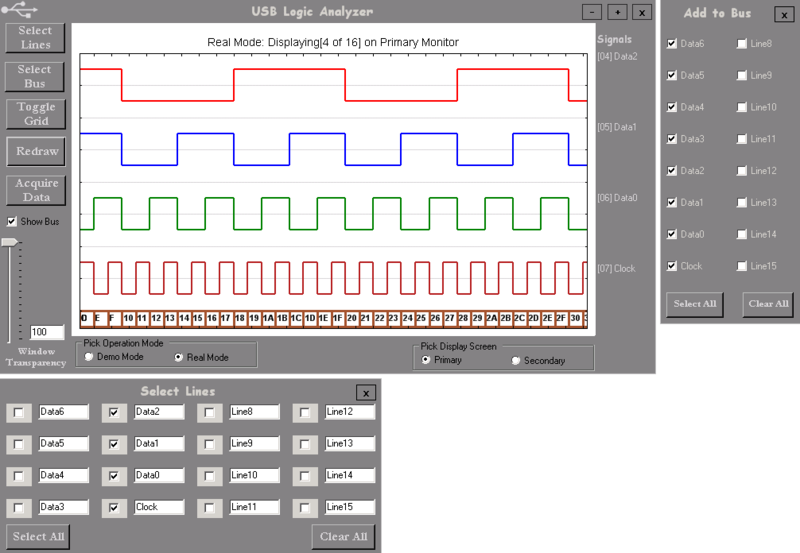 The USB Logic Analyzer is a fully functional standalone software application now. It is interfaced with the XEM3001 FPGA board and it reads simulated data (8-bit binary counter) from the FPGA over USB correctly. I was able to figure out how to communicate with the FPGA board and read the buffer and then use part of Jason's C++ program from last year to parse the data correctly. Since there is no external PC board (hardware part of the project was terminated when Jeff left the project) to sample signals the FPGA puts an 8-bit binary count value in the buffer, which is a great way to demonstrate functionality. On the software side there have been tons of additions. I added in a data bus, I was able to read the logic lines and combine them into a hex value that is displayed on the plot surface. The user has the ability to select the lines added to the bus independent of the lines being plotted. The user can also save the plot in image format (png, jpeg, bmp, and gif) or in numeric format (csv). The saved CSV data file can be loaded back into the application in the future and all the software features can be used for analysis. The screen shot of the application visually explains a lot of these features. The project will be presented to faculty and students at the Senior Capstone Presentations on April 27th (tomorrow) at 8:30am. The presentation will be made available as part of the deliverables at later date. The final demonstration of the project will take place in Senior Lab on Friday, April 28th between 12 and 1 pm. The final post to this website will be made once the final report has been approved for submission, at which point the project will be completed and all deliverables will be available here. The Opal Kelly XEM3001 sends an eight bit data stream over USB to the C# core program via some C++ executables (soon to converted to pure C#). The C# GUI plots the acquired data and still allows for all the functionality mentioned in previous entries! Expo visitors will be able to play with the product using a 17" touch screen monitor (the GUI was modified for easier touch navigation). Positioning was a difficult task especially with keeping resizing in mind. I also improved error handling, especially focusing on application crashing when no lines were selected to be plotted. I found that this scenario was problematic for everything... plotting, resizing, refreshing, any form movement at all. Currently the GUI is fairly stable and mostly idiot proof. My next challenge is to add the bus and use the mouse cursor to read the bus value and display it. Again, if anyone is interested in helping me test the application, you can download and run the compiled binary (for Windows XP) and provide me with any feedback via e-mail. Here's a snapshot of the current GUI. I am working on adding more features to the GUI and representing buses. If anyone is interested in helping me test the application, you can download and run the compiled binary (for Windows XP) and provide me with any feedback via e-mail.